Workshops are designed for the discerning photographer in many ways. Whether you are a complete beginner looking for a helping hand in starting out or an experienced Amateur that wants to work on a few techniques, Danny is running small workshops for the annual Red Deer Rut. 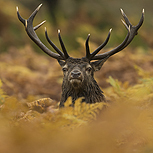 Based in Leicestershire, these workshops are timed to coincide with the Red Deer rut which will have reached its frenetic peak during the month of October. Danny’s knowledge of the area is second to none and he will take you to the best areas in search of Deer, which will range from females with calves and large dominant stags fighting for their attention. The Stags at this time of the year are magnificent and Danny would have worked out the most dominant males and their favourable areas. 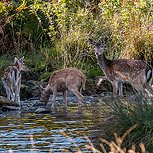 You will also get the opportunity to photograph Fallow Deer and also take some landscape photographs of the park because the autumn colours will also be at their peak. This part of Leicestershire is a beautiful area during autumn and the photographic opportunities will be endless. The workshop will last until dusk, and a late breakfast is provided at a local restaurant. All photographic standards are welcome and you can be assured of individual tuition. A 300 mm telephoto lens or longer is required and also a sturdy tripod. The walking is relatively easy and not long distances but could involve walking over uneven ground for the Deer. We meet at Bradgate Park in Leicestershire at 6.00 am. The gates to the car park are open and you will need to bring along some change with you for the car parking. Based in Bradgate Park Leicestershire, the workshop is timed to coincide with the Red Deer rut which will have reached its frenetic peak. I will take you to the best areas in search of Deer, which will range from females with calves and large dominant stags fighting for their attention. You will get the opportunity to photograph Fallow Deer and also take some landscape photographs of the park. This part of Leicestershire is a beautiful area during autumn and the photographic opportunities will be endless. The walking is relatively easy and not long distances but could involve walking over uneven ground for the Deer. A late breakfast is provided at a local restaurant at around 11.00 am. It is best to bring a small flask of tea or coffee and some nibbles with you for the afternoon. The workshop is scheduled to finish at dusk or depending on the weather conditions.